I’ve been working with Pacific Film Archive on restoring 8 films by the wonderful Chick Strand. One of them, an early favorite called Waterfall (1967), is composed of almost entirely of hand-processed, solarized, black and white negative. I was surprised to discover, upon winding through the original, that some odd tarnishing/discoloration had occurred in a few spots. This probably gradually developed over the years. An internegative made ten years ago displays these artifacts too, so they’ve been there for some time. Vintage prints from ca.1972-73 don’t have them. At any rate, they’re in only a few places, Chick accepted them in the previous internegative, and they’re not aesthetically very out of character with the rest of the film, so it was decided to leave them alone. I’ve attached a photo of the original here so you can check it out. Another thing to note in this photo – the perforation damage. The last time the original was printed, it was damaged somewhat extensively, but thankfully only resulting in torn perforations – albeit 30ft. of torn perforations. But no image damage. Some of it was edge-taped at the time, some not. At first I was concerned that, even with better tape repairs, the original was too fragile to risk printing again. But realizing the original is entirely double-perf stock (as seen in the photo here), I came up with an alternate solution which would simply involve printing it from heads-to-tails using the other side of the perforations. 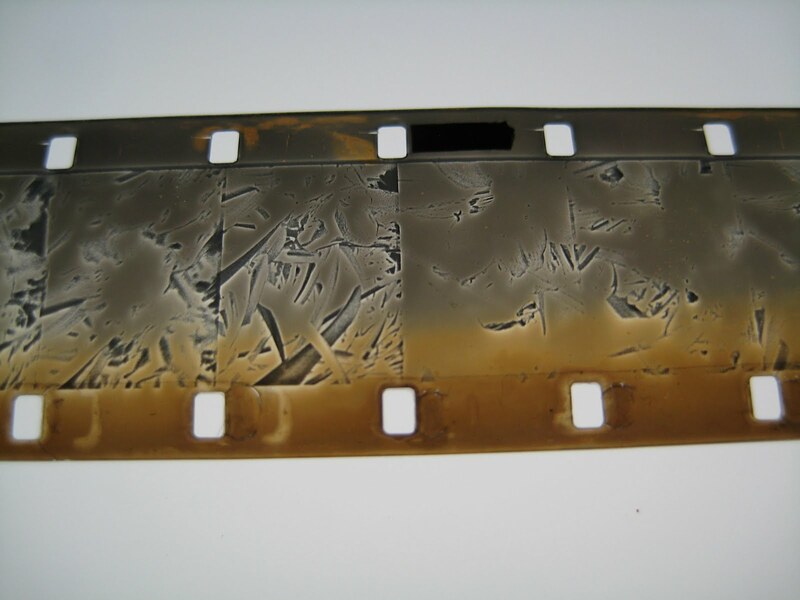 Normally, this original, which is A-wind, would need to print from tails-to-heads, because of its emulsion position (16mm can have the emulsion on either side in relation to perforation/soundtrack placement). But as it’s double-perf, we can do it the other way around too. So the perf damage will still be fixed better, but we won’t have to be as freaked out printing it, since we’ll be using the undamaged perf side to drive the film through the printer. One final thing I discovered in working on this film also concerns emulsion position (B-wind vs. A-wind). Upon inspecting some early Kodachrome (7387) prints, I discovered that the original lab that had printed the film (Deluxe Hollywood), had treated the film, not surprisingly, as B-wind. Most 16mm originals are B-wind, and in fact there’s a mix of both A-wind and B-wind material in the film, though it’s almost entirely A-wind. So when Deluxe originally printed this original, they printed it with the emulsion flopped for almost the whole film, so all the early Kodachrome prints were soft, except for the three or four short shots that were B-wind in the original. (All the other shots printed as slightly soft, because the film was printing through the base rather than emulsion.) When the original was printed again by Chick in the late ’90s (at FotoKem this time), they got it right, printing it correctly as A-wind. I didn’t want to just assume anything though, so I did a close inspection of several prints and the original, and talked to some folks very close to Chick (she had passed away before I could ask her about this). We all concluded that printing it as A-wind was the better way to go. I really appreciate your preservation work on Ms. Strand's films. The Pacific Film Archive is great. I saw a bunch of her 16mm films beautifully projected at Redcat a few years ago. A lot of teh films were visually striking and cinematically exciting. She was also there to celebrate her birthday and she was great. Very youthful with a great sense of humor and she said she was working on a few more 16mm films on her flatbed editing machine at her home. All of which made me even more sad and surprised to hear that she died so soon afterwards. She is a great visual filmmaker and your preservation efforts would have made her proud. I don't know why I came up as anonymous on my last comment. My name is Doug and I met you a few years ago at the Leo Bing theater when you gave a lecture on Will Hindle's astonishing poetic 16mm films and detailed your great preservation of them. I also met you at Echo Park Film Center and we had a great talk about Scott Bartlett, my abstract 16mm movie “palms”, and photo-chemical motion pictures. I wanted to get back in touch with you. after 3 years of struggling I finally finished my movie last year and I would like to show it to you. I also really want to see your 16mm work “The Wofobs” and your home movie of your cousin's wedding. Please feel free to email me at dgtolstoy@yahoo.com unfortunately i've been stuck out here in Vegas for the last 3 years and I can't wait to get back to LA. I feel like Stan Brakhage back in the 1950s, broke and unappreciated. it would be great to correspond with a real cinema lover and filmmaker such as yourself. I meant the “Linwood Dunn” theater not leo bing!